While the two cinemas in St Andrews were often in competition with one another, the 1950s brought a wholly different adversary that threatened to seriously decrease the size of their audiences: it was the beginning of the era of television. One of Hollywood’s answers to the disappearing cinema audience was the introduction of CinemaScope in 1953. This format differentiated from the small screen, by using a widescreen image that suited westerns, historical epics, musicals and other genres that relied on panoramic shots, action scenes and spectacle. In December 1954, The New Picture House announced that it would install the first CinemaScope in St Andrews, and only the second in Fife; the other being at Kirkcaldy. The local paper explained that CinemaScope would ‘produce a panoramic picture effect which is achieved by the use of a new lens which projects a picture on a screen that is over forty feet in width’ and ‘is slightly curved and creates thereby an illusion of depth’ (The Citizen, 4 December 1954, p. 5). The first screening took place on 20th December 1954, and was a musical comedy Lucky Me (1954), starring Doris Day. Though no subsequent reviews of the event exist, the neighbouring Cinema House evidently recognised its potential impact and underwent its own installation of the CinemaScope. This installation was, The Citizen reported, completed by a firm that ‘came up to St Andrews from Buckingham Palace where they had been installing a similar apparatus’ (The Citizen, 22 January 1955). Indeed it was The Cinema House that would most strongly embrace this new technology, running an extensive promotion campaign in the local magazines in the coming weeks and years. The first screening in CinemaScope at The Cinema House brought an enthusiastic response from The Citizen, which stated that the ‘mellow and restrained sound was in particular admired, while the coloured panorama of the film brought out the fullest possibilities … in a strikingly effective way’ (The Citizen, 29 January 1955). Advertisements in The Citizen and even in the Madras College Magazine promised ‘Glorious Technicolor’ and ‘Breathtaking CinemaScope’ and sought to position film apart from television and other forms of entertainment. In this way, the advertisements built on the promises of ‘luxury and elegance’ that had been present since the cinemas first opened in town. The existence of the technically sophisticated equipment also meant that St Andrews was able to present the very latest spectacles intended for the wide screen, ranging from River of No Return (1954) and The Bridge on the River Kwai (1957), to In Like Flint (1967) and a variety of Walt Disney Feature Animation films. The introduction of the Cinemascope appeared to usher in a new and exciting era for St Andrews cinemagoers, but this was not to last. 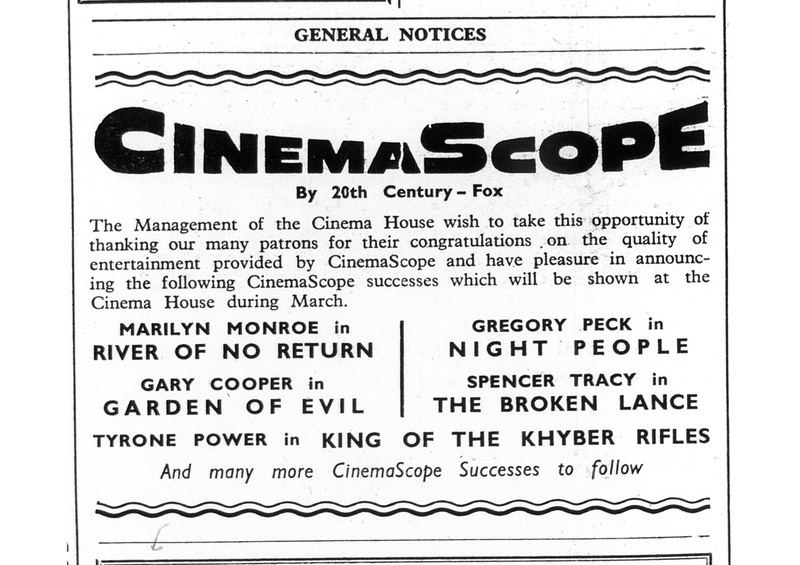 After fourteen years the production of CinemaScope films concluded, and the local cinemas now largely advertised the content rather than technical aspects of the films. 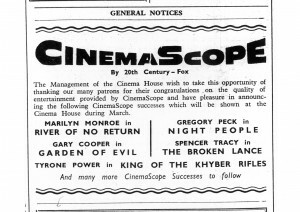 The last screening advertised with CinemaScope took place in The New Picture House on 3rd February 1968 with the rerun of The Guns of Navarone (1961).